BMW hosted a lengthy press conference during which cars zoomed all around its raised track, and at the end the Vision EfficientDynamics Concept silently took the stage. It's a glass-topped Hot Wheels with two engines, a deep dish seventies-looking steering wheel and matching contoured wheels. Around the back corners the design elements get a little busy, but taken as a whole the EfficientDynamics Concept comes together well. Give it a more demure paint job and its built-in details will stand out beautifully. If this is the real future of eco, then sign us up schnell. Full details in the press release after the break. 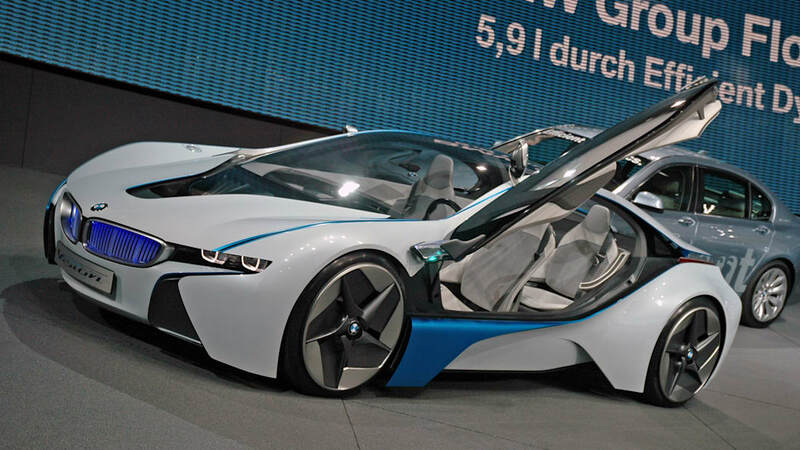 The latest BMW Concept Car for the EfficientDynamics philosophy. Woodcliff Lake, New Jersey, 29 August 2009, 6pm Eastern... For decades, BMW has made the reduction of emissions and fuel consumption a key part of its product development strategy, just as enhancements to the dynamic ability of each BMW have been a lasting, sustained brand value. BMW's EfficientDynamics engineering philosophy – the pursuit of an enhanced, athletic driving experience while simultaneously lowering the consumption and emissions of each vehicle – resulted in the most dramatic drop in fleet consumption of any automaker from 1990 through 2005, according to an Environmental Defense study. 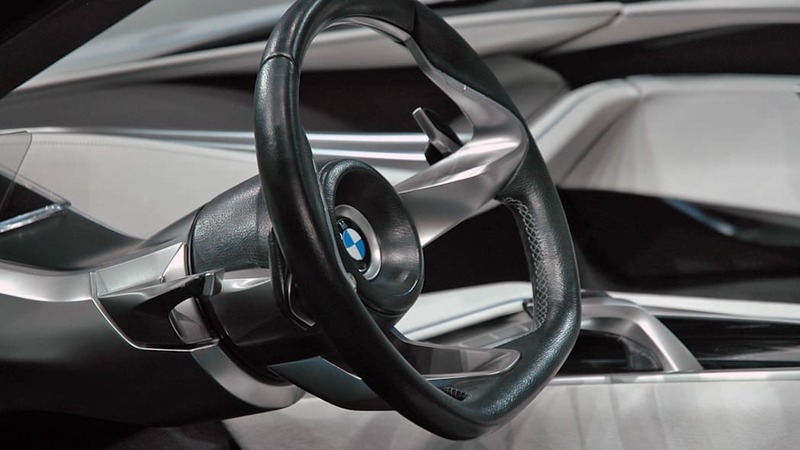 BMW Vision EfficientDynamics is the result of a "clean-sheet" development process to ensure that the correct achievements were made in the areas of efficiency, driving pleasure, technology, and emotional design. 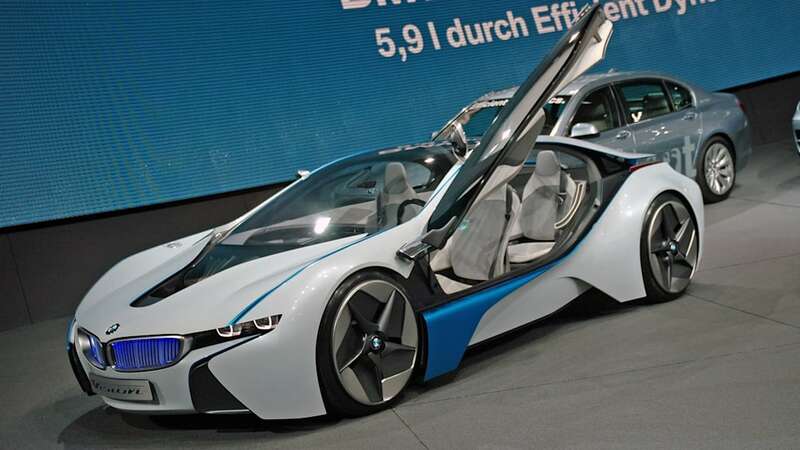 BMW Vision EfficientDynamics is the most comprehensive implementation of the EfficientDynamics philosophy seen so far. The powertrain provides a top speed limited electronically to 155 mph, with acceleration to 100 km/h in 4.8 seconds. Average fuel consumption in the EU test cycle is 3.76 liters/100 kilometers, equal to 62.6 mpg, and the CO2 emission rating is 99 grams per kilometer. CO2 emission management is even more outstanding when driving in the all-electric mode after charging the battery from a plug-in source: Taking all emissions in the generation of electricity into account, as prescribed by the EU formula, the car's emission rating is just 50 grams per kilometer. Through this unique balance of driving pleasure and fuel efficiency, the BMW Vision EfficientDynamics concept car clearly demonstrates the potential of BMW ActiveHybrid technology, which makes its world debut at the 2009 Frankfurt Motor Show in the BMW ActiveHybrid X6 and BMW ActiveHybrid 7 production models. The power and performance are made possible by combining a fuel-efficient 3-cylinder turbodiesel with one electric motor on each axle. The intelligent combination of these units, together with precisely controlled energy management, simultaneously enhances the dynamic performance and the efficiency of the car. Overall system output is 356 horsepower, and peak torque is 590 lb-ft. The special arrangement of the two motors and diesel engine allows all-wheel drive when driving in all-electric mode. The result is minimum power loss and a harmonious transmission of the power available under all conditions. Turbodiesel engine with unprecedented specific output. 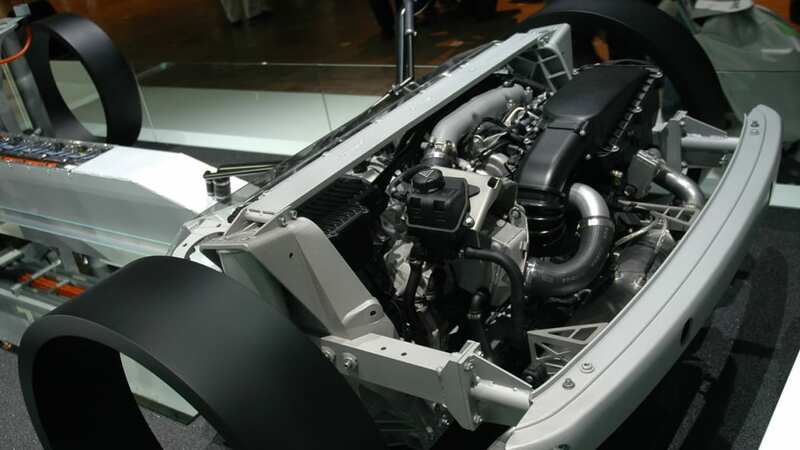 The specific output of 109 hp per liter sets a new benchmark in diesel technology. The power delivered by the turbodiesel is conveyed to the rear axle by means of a double-clutch transmission (DCT). This advanced transmission technology, which already offers a particularly dynamic driving experience in BMW's M3 and Z4 Roadster, allows the driver to shift gears without the slightest interruption of power. BMW Vision EfficientDynamics features a newly-developed version of BMW's DCT with six speeds for maximum efficiency and flexibility. The combustion engine is supplemented by two electric motors. Consistently applying the BMW ActiveHybrid philosophy, development engineers followed the principle of "Best of Hybrid," choosing the optimum combination of a hybrid synchronous motor on the front axle and a full-hybrid system at the rear. In this concept, the driver benefits from the efficiency of the electric motors over a far wider speed range than with a conventional hybrid car. The rear axle comes with a second-generation full-hybrid system corresponding to the technology in the BMW ActiveHybrid 7 production model. The compact electric motor positioned between the diesel engine and the DCT outputs a consistent 33 horsepower and is able to reach a peak of up to 51 hp. Maximum torque for the rear electric motor is 214 lb-ft, the power, either supporting the diesel engine or in all-electric motoring. When coasting or applying the brakes, the electric motor acts as a generator and feeds electric power to the lithium-polymer battery in the car. The electric energy developed in this way is therefore captured without any additional consumption of fuel through the principle of Brake Energy Regeneration. Energy wasted on the brakes of a conventional car is thus saved within the new power system for subsequent use in driving the car. A second electric motor acts on the front axle. This engine, a hybrid synchronous motor, offers continuous output of 80 horsepower and peak torque of 162 lb-ft. Extra power of 112 horsepower is available for a period of up to 30 seconds, and, for a 10-second "burst," the electric motor is able to develop 139 horsepower. The power is transmitted through a 2-stage, single-speed reduction gearbox. 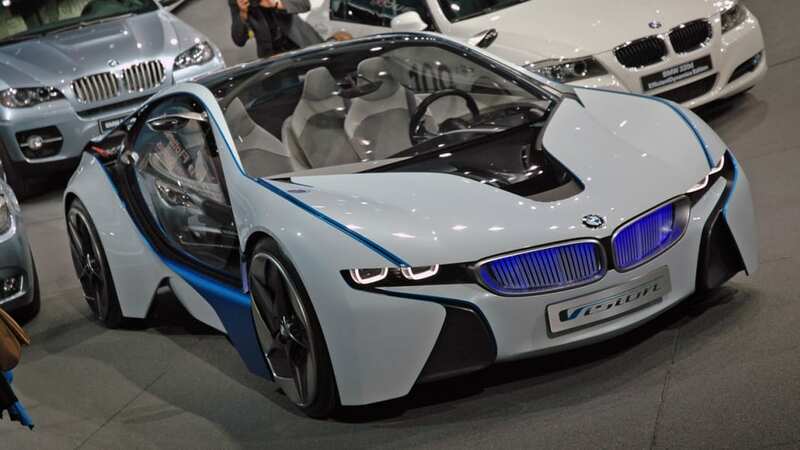 BMW Vision EfficientDynamics is able to run completely under electric power, with the power of the turbodiesel engine alone, or through an infinite combination of the three power sources. Depending on driving conditions, the two electric motors may be used both for accelerating and for regenerating energy when applying the brakes and while coasting. This principle ensures efficient energy management, with the charge status of the lithium-polymer battery constantly remaining within the optimum range. When accelerating, the electric motors help to boost the car for even greater performance, ensuring immediate response and a significant reduction in fuel consumption. For a short time, such as in passing maneuvers, the cumulative maximum output of all three engines increases to 356 hp, with maximum torque generated by the three engines reaching 590 lb-ft.
Lithium-polymer battery for electrical energy. 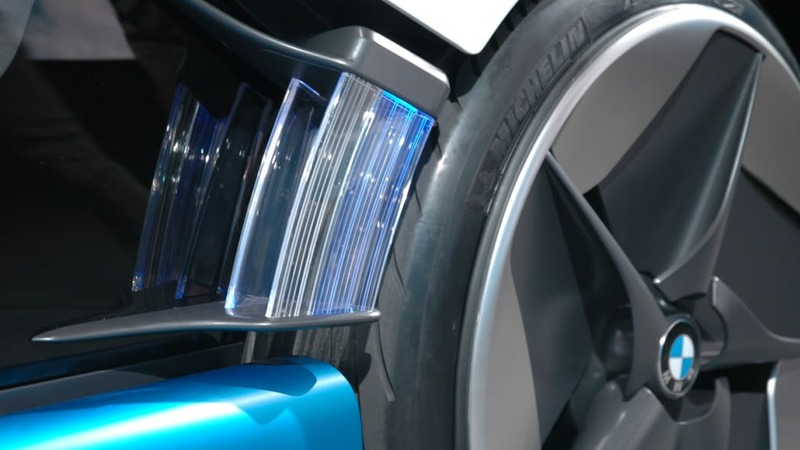 The energy cells featured in BMW Vision EfficientDynamics are housed in a chassis element running from front to rear through the middle of the car. The front unit is the lithium-polymer complex, an ongoing development of the lithium-ion battery. 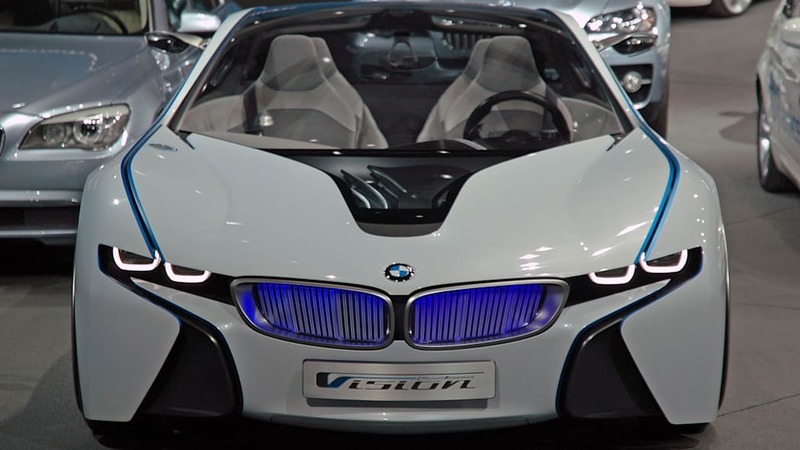 Overall, BMW Vision EfficientDynamics comes with a total of 98 lithium-polymer cells, each offering a capacity of 30 amp/hours and developing continuous output of 600 Amps at a voltage of 3.7 V. For a period of 30 seconds, each cell is even able to develop maximum output of 1,200 Amps. Serial arrangement of the lithium-polymer cells serves to generate nominal voltage of 364 volts, the gross storage capacity of the battery is 10.8 kW/h. With an unusually high discharge capacity of 80 percent, the battery delivers 8.6 kW/h for driving the car. This superior performance comes on overall weight of the entire energy storage system of just 187 lb. A further advantage is that through their optimum dimensions tailored to the specific qualities and features of the car, the lithium-polymer cells, together with the operating strategy chosen with a concept of "forward looking" energy management, reduces the thermal load acting on the battery to such an extent that there is no need for active cooling. Plug-in solution: convenient charging of the electric power system from a conventional power socket. Brake Energy Regeneration captures electric power generated while driving without additional fuel consumption, which is subsequently used to supply power to the electric motors and on-board network. 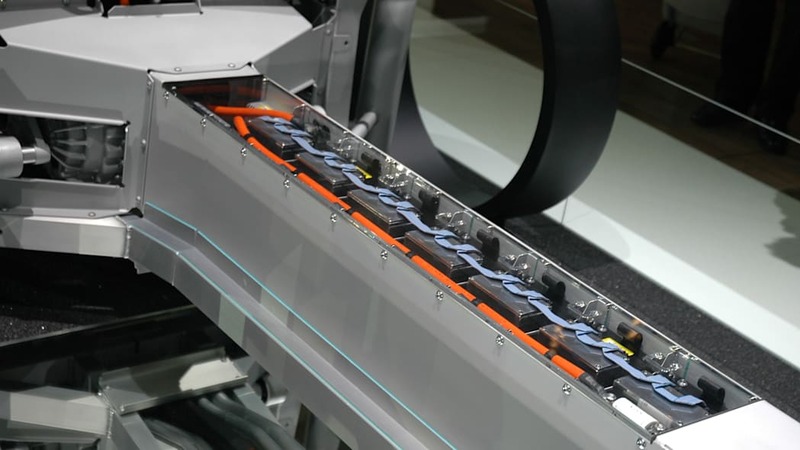 A further option is to connect the lithium-polymer cells to a conventional power socket for a simple and efficient charge process, using a plug-in connector in the front-right wing of the car. Connected to a standard EU power outlet (220 V, 16 Amps), the system requires a maximum of 2 ½ hours to fully charge the lithium-polymer cells. And wherever a power source with higher voltage and amperage (380 V, 32 Amps) is available, the charge time is an even shorter 44 minutes. In addition to electrical energy storage, BMW Vision EfficientDynamics comes with a conventional fuel tank at the rear end of the central chassis tunnel, offering a capacity of 6.6 gallons. Running on diesel fuel alone, BMW Vision EfficientDynamics is able to cover a distance of approximately 400 miles with its combustion engine. Benefitting from an extra range of up to 31 miles in the all-electric mode, the car offers an overall range of approximately 431 miles. As a result, this unique concept car offers all the requirements for using energy with maximum efficiency and at the same time experiencing the dynamic performance typical of BMW without any restriction of everyday driving qualities. Performance, fuel efficiency and emission management opening new dimensions in hybrid technology. The power delivered by the two electric motors and single diesel 3-cylinder engine gives the BMW Vision EfficientDynamics concept a level of performance superior to anything provided so far by a hybrid vehicle. Acceleration from a standstill to 100 km/h, for example, comes in just 4.8 seconds and the car could exceed its electronically-limited 155 mph top speed. At the same time fuel efficiency and emission management now reach a standard only achieved, if at all, by far less powerful small cars conceived for city traffic and short distances. Applying the criteria of the EU test cycle, BMW Vision EfficientDynamics offers average fuel consumption equal to 62.6 mpg. CO2 emissions, in turn, are 99 grams per kilometer. These consumption and emission figures are measured on a consistent internal power balance, meaning that the batteries and storage media for electrical energy maintain the same charge level throughout the entire test cycle (with the same level at the beginning and end) and are charged while driving only by the car's on-board systems. As a plug-in hybrid, BMW Vision EfficientDynamics is able to cover the entire drive cycle for measuring fuel consumption also with its combustion engine completely switched off. Then, to subsequently charge the lithium-polymer cells to the same status as when setting off, all the driver has to do is connect the car to an external power grid. To determine the consumption of electric power, the only requirement is to compare the charge level of the battery before and after the test cycle. Applying this measurement process, the BMW Vision EfficientDynamics concept car consumes 17.5 kW/h per 100 kilometers, equal to a CO2 emission rating of just 50 grams per kilometer in the EU test cycle. To determine the total volume of CO2 emissions when driving in the all-electric mode, new legal standards for measuring the level of fuel consumption are currently being prepared for hybrid and electric cars with a plug-in power supply. 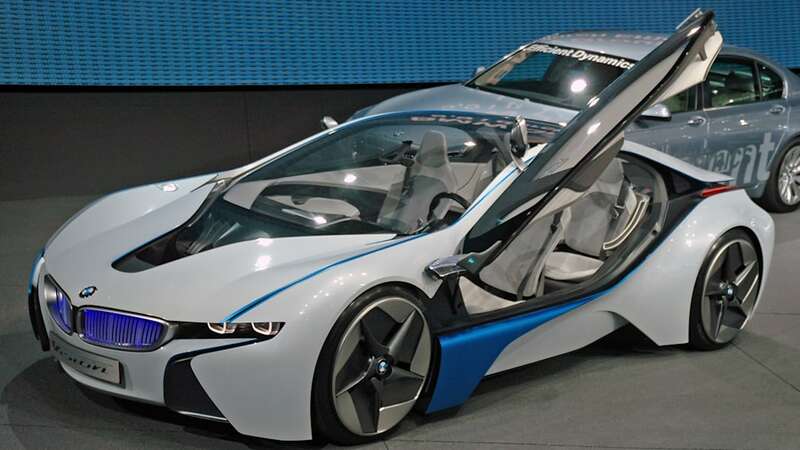 Applying this calculation method, the CO2 emission ratings generated by BMW Vision EfficientDynamics are reduced further to just one-third of the original figure of 99 grams per kilometer. Clearly, this significant reduction of emissions opens up a new dimension in BMW's EfficientDynamics development strategy in this unique concept car. Aerodynamic qualities reflecting BMW's Motorsport experience. BMW Vision EfficientDynamics also takes a new approach in its design and streamlining, the body and the interior clearly expressing the unique combination of supreme efficiency and the sporting performance of the brand. Following BMW's design language, this concept car visualizes both highly efficient aerodynamics and intelligent lightweight construction. 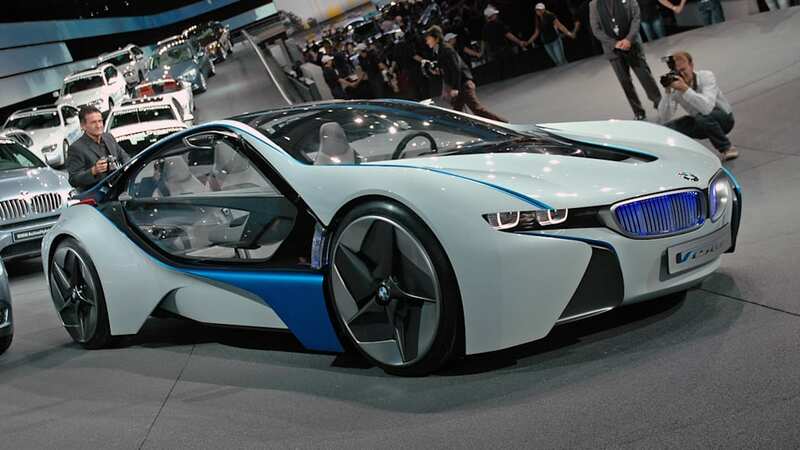 In its design, BMW Vision EfficientDynamics differs from the usual low-emission car concepts. The principle of "form follows function" is not just for the overall look of the car, but embraces each and every detail. Measuring 48.8" in height and boasting a sweeping, arch-like roofline, BMW Vision EfficientDynamics offers the slender silhouette of a classic Gran Turismo. With the combustion engine fitted in front of the rear axle, the designers have succeeded in giving the car a very low front end, with the flow of air being further smoothened by active louvers in front of the radiator, which close completely when the need for cooling air is low. 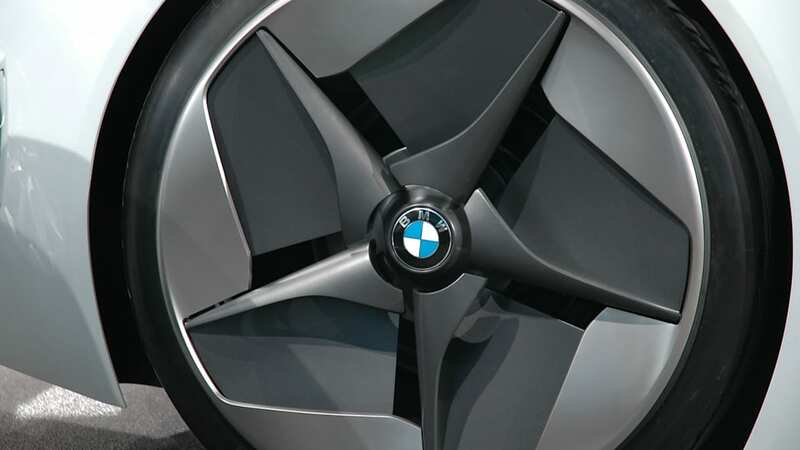 This efficient function follows in the footsteps of the active air flap control already used as a feature of BMW EfficientDynamics in some of BMW's current production models. As a further highlight, BMW Vision EfficientDynamics guides air smoothly and exactly as required into the car through an active air intake at the front. Numerous details in the design of the body are based on the know-how BMW has gained in Motorsport, a number of body elements serving as air deflectors and guide vanes. Designed as ducts, for example, the A-pillars serve to channel the flow of air in the same way as the rear lights with their wing profile. The floor of the car is fully covered from front to rear and from one side to the other, thus maintaining a smooth surface to avoid any air swirl liable to increase fuel consumption. Slender openings around the front air dam guide the air flowing specifically into two closed ducts leading inside the front air dam to the wheel arches where the air comes out again through a very slim aperture at high speed, flowing just next to the outer wheel flanks. This air jet rests on the front wheels like a curtain and is therefore referred to most appropriately as the "air curtain." It provides a highly stabilizing effect. To further optimize the aerodynamic qualities of the entire vehicle and keep rolling resistance to a minimum, BMW Vision EfficientDynamics comes with tires and wheels of quite unusual size on a sports car. The tires measure 195/55, while large 21-inch wheels provide a contact surface on the road otherwise offered only by a much wider tire. In combination with the sophisticated axle geometry, this ensures agile driving behavior. 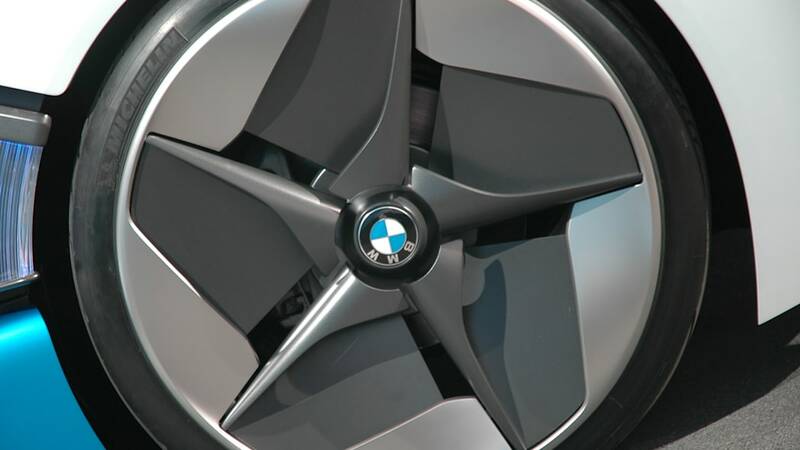 The extra-large wheel covers extending over part of the tire flanks add to the unique, very different look of BMW Vision EfficientDynamics from the side. The blade profile integrated in the wheels serves furthermore to reduce the negative effect of the turning wheels on the overall aerodynamics of the car. 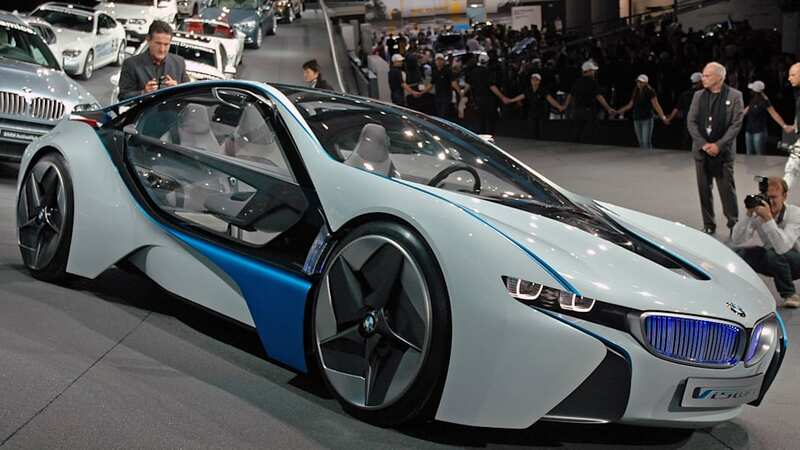 In all, these features optimizing the aerodynamic qualities of the car give the BMW Vision EfficientDynamics concept car a very low drag factor (CX) of just 0.22. In both exterior and interior design, BMW Vision EfficientDynamics stands out clearly as a strong spearhead in technology. 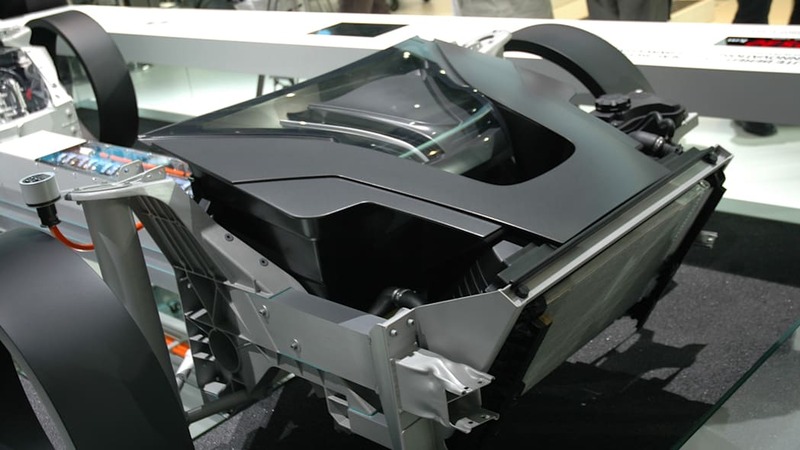 Many components of the vehicle are presented in full view expressing the "transparent" character of the car as a powerful visual feature of lightweight technology. 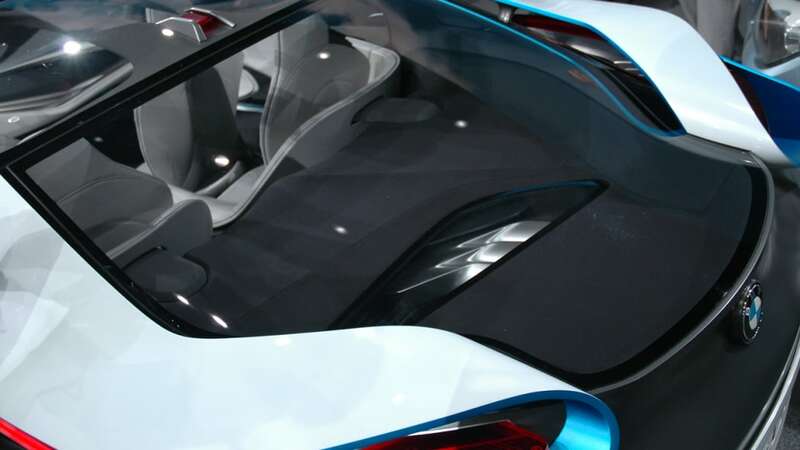 The chassis and suspension of BMW Vision EfficientDynamics are made completely of aluminum; the roof and the outer skin on the doors are made almost completely of a special polycarbonate glass automatically darkening as a function of the light shining on the car. Measuring 181.1" in length, 74.8" in width and 48.8" in height, this unique concept car offers ample space for up to four passengers and their luggage. Thanks to the consistent lightweight construction strategy applied on the car, curb weight is 3,076 lb, with the center of gravity remaining very low. 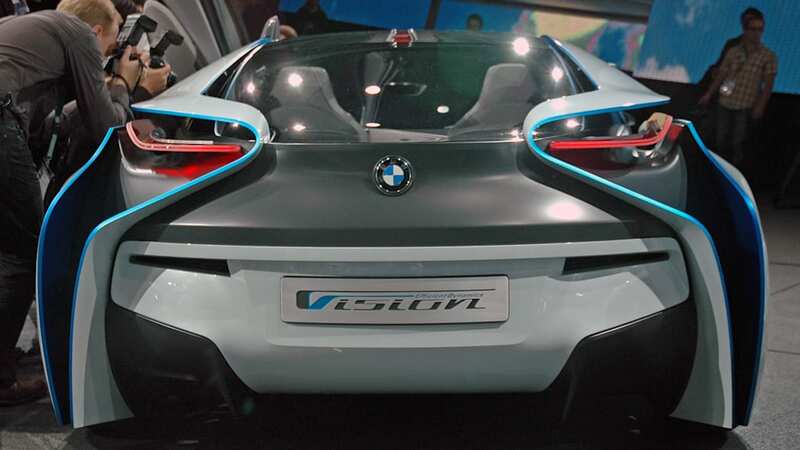 In its power-to-weight ratio, the BMW Vision EfficientDynamics concept car is far superior to all other hybrid cars, achieving the same standard as extremely dynamic sports cars with a conventional combustion engine. Carrying a maximum payload of 981 lb, this unique 2+2-seater is fully suited for everyday traffic. Luggage capacity of 5.3 cu ft, in turn, allows the driver and passengers to conveniently take along two golf bags. And to meet additional loading requirements the backrests of the two rear seats may be tilted down individually to provide extra storage space. This has been achieved through the close cooperation of BMW's Design and Technical Development Divisions starting at an early point and continuing consistently throughout the entire development process. The result is a brand-new vehicle architecture with the drive components as well as the body and interior elements perfectly coordinated and matched to one another with maximum flexibility and individual style. A fully integrated design philosophy also provided new options in using harmonized design principles connecting the exterior and the interior and providing an interacting effect between the two areas. 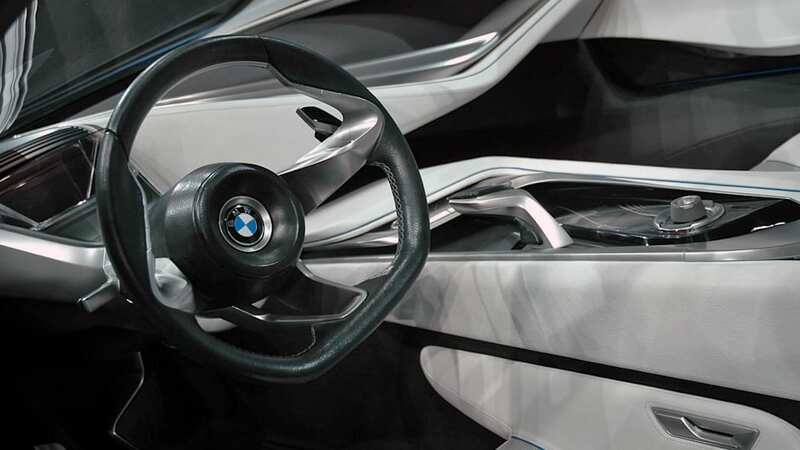 Sculptural design language giving BMW Vision EfficientDynamics a fully harmonized, complete look ensures the proportions typical of a BMW sports car. The front, side, rear and roof areas, for example, flow smoothly into one another. Dynamically contoured surfaces and shapes, in turn, create highly attractive light and shade effects accentuating the light and sporting character of the car in an emotional manner. Layering technology developed by the BMW Group Design Division acts as the fundamental guideline in designing the exterior and interior. Applied for the first time in exterior design, this technology layers one surface on top of the other, creating very smooth seams and joints to reduce the number of components and, accordingly, the weight of the car. As a result, BMW Vision EfficientDynamics meets the most demanding aerodynamic requirements without using any additional body elements, simply through the structure of the surfaces optimized for a smooth flow of air. In the design of the interior, innovative layering technology provides an unprecedented symbiosis of function and stylish shapes intentionally reduced to a minimum, consistently implementing and visualizing the lightweight principle also inside the car. This interaction of lightweight construction and individual well-being also comes out clearly in the design of the controls and switches, with a leather band, for example, running round the aluminum gear selector lever on the center console. 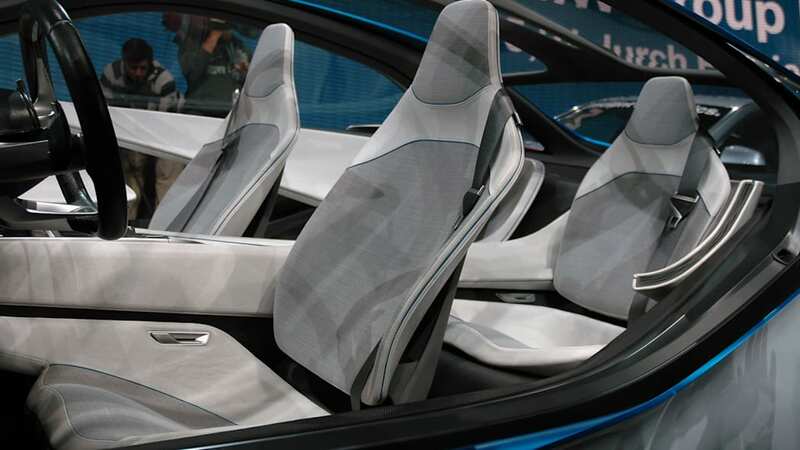 Materials combining lightweight technology and all the qualities required are also to be admired all round the cockpit of BMW Vision EfficientDynamics, giving the car an unusually generous feeling of space for a 2+2-seater. The body-contoured seats, for example, are made up of a kevlar shell, a backbone structure, and seat padding with personalized fillings. Clearly, this combination alone ensures comfort at a minimum weight. The driver's and front passenger's seats are connected firmly to the center console to form a joint interior "landscape", while the rear seats anchored on the floor would appear to be hovering in space. Natural materials and light colors on the seat upholstery and all interior linings underline the light, sophisticated and sustainability-oriented atmosphere within the passenger compartment. The instrument panel is deliberately padded only where technical components have to be appropriately covered, thus making an important contribution to passenger safety in the event of a collision. 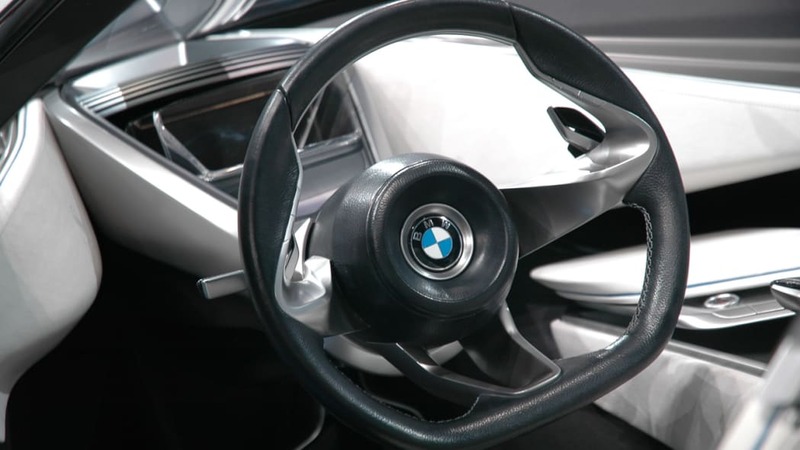 The instrument cluster played a fundamental role right from the start in the design process, serving as the starting point for all surfaces within the interior and thus creating a particularly powerful rendition of that driver orientation typical of BMW. 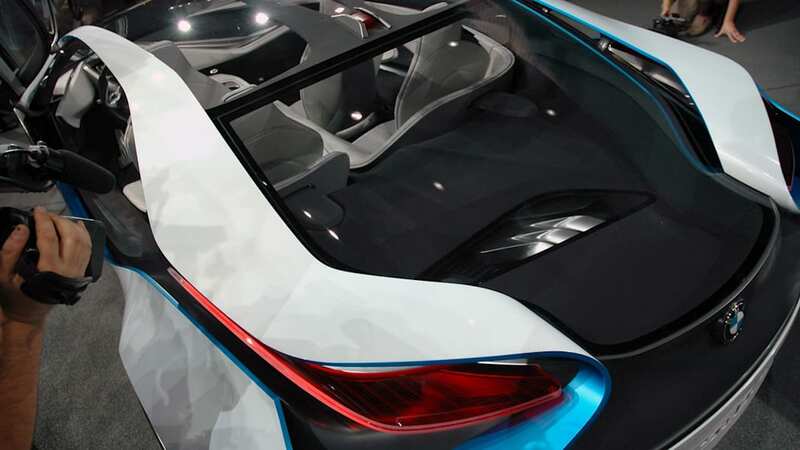 LED lights at both the front and rear end of BMW Vision EfficientDynamics provide an innovative combination of the symbols typical of the brand and clear design language oriented towards trendsetting technology. The distinctive look of the dual round headlights characteristic of a BMW is emphasized in particular by the use of LED technology. The rear lights are integrated also in their function into the design of the entire rear section, forming part of the rear air deflector and thus merging completely into the rear contour. Extremely flat and compact, the rear lights are made up of innovative LED units forming a smooth and consistent red surface when not in use. Only when used do the respective light chambers take on the appropriate color such as yellow on the direction indicators. This innovative light technology also provides an intense symbiosis of the exterior and interior, again promoting and further refining the driving experience. Overhead doors for convenient access to all seats. 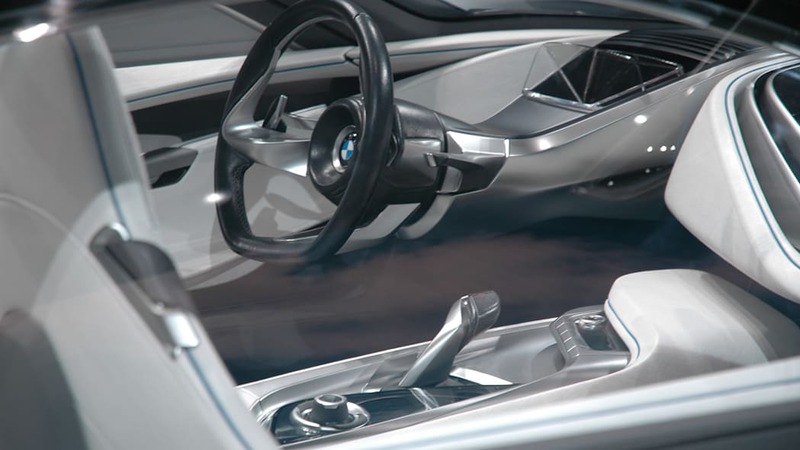 The doors on BMW Vision EfficientDynamics open up like bird's wings, turning on pivots in the front roof column at the level of the side direction indicators. Since the car has no B-pillars, the large door cutouts ensure convenient entry also to the rear seats. The pivots on the doors also provide the base for the exterior mirrors, thus forming an ideal combination of function and aesthetic design. The structure of the doors is also characterized by several layers of materials on top of one another and the optical and functional symbiosis of the interior and exterior this technology is able to offer. Made up of three layers, the overall structure comprises the outer glass surface, an interim load-bearing layer, and the interior cover with its particularly smooth shapes and fl owing forms clearly visible to the passengers, layering technology again, therefore, opening up new perspectives. The large glass surfaces extending far down on the body also provide a strong optical impression of the low seating position close to the road. And at the same time a stable sidebar ensures the body stiffness and crash safety naturally required on every vehicle. Flowing to the inside at its central point, this safety element also serves as an armrest. This interplay of the three layers also helping to minimize the weight of the car continues on the trim bar running along the door and extending out of the armrest, finally flowing into the outer door opener on its path from inside to outside. Clear focus on the essential: 3-dimensional Head-Up Display. 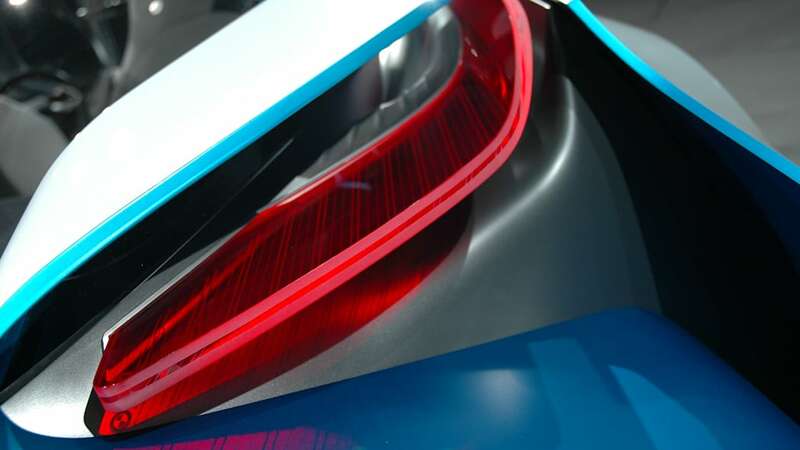 Layering technology is also used on the displays in the instrument cluster and in the Head-Up Display developed to an even higher standard on BMW's new concept car. The Display now creates a powerful impression of three dimensions, at the same time providing the option to present various signals more in the front or more in the background, depending on their relevance and current driving conditions. The Head-Up Display projects information important to the driver on to the windscreen. Indeed, innovative presentation technology even allows the superimposed presentation of several views in three dimensions, keeping, the gauge graphics visible in the background while the latest information on route guidance or warning signals from BMW Night Vision, for example, are shown in the foreground. The sequence in which such signals appear depends on the driving mode chosen by the driver, the display technology, again depending on the driver's personal preference, enhancing a particularly sporting, a more comfort oriented, or an efficiency-based style of motoring. Through its design alone, the BMW Vision EfficientDynamics concept car clearly shows that highly efficient individual mobility may by all means be presented in emotional style. BMW already offers models in all vehicle segments which, compared with the competition, ensure the lowest level of fuel consumption and emissions combined with superior power and performance. And now BMW Vision EfficientDynamics confirms BMW's commitment to offer a perfect combination in future of unique driving pleasure and optimum qualities in the responsible use of natural resources. In the design process the need for sustainable management is borne out most clearly by the GINA (Geometry and Functions in N-fold Augmentation) concept developed by the BMW Group. In this case maximum creative freedom sets the foundation for innovative solutions challenging the conventional and meeting the requirements of the future. This makes the GINA principle particularly well-suited for developing visions for the future reflecting both the wish for emotional style and individual character as well as the quest for sustainable management and efficiency. 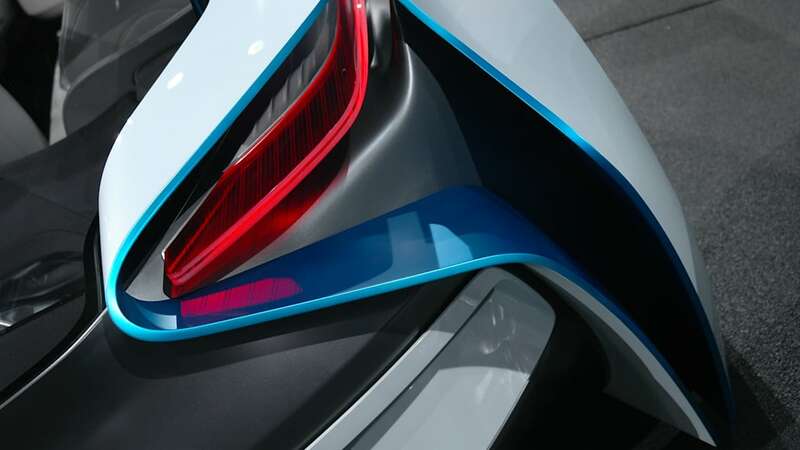 From the dimensions of its wheels through the design of the rear lights and all the way to the configuration of the cockpit, BMW Vision EfficientDynamics therefore boasts a number of details both outside and inside which, going far beyond conventional solutions, open up a new approach to maximum efficiency and that Dynamic ability typical of BMW. Should the high-performance central computer establish, for example, that the driver is about to take the motorway, the power used for running the cooling system is reduced for a certain period in advance, on the assumption that the short increase in coolant temperature resulting from such an energy-saving measure will quickly be set off by the higher speed of the car on the motorway. Another example of such pre-conditioning is the regeneration of energy from the air conditioning, from Electronic Power Steering and the Brake Assistant.